Birmingham City boss Lee Clark has responded to his side's string of defensive injuries by bringing in former West Bromwich Albion left-back Paul Robinson on a short-term deal. Robinson, 33, who was released by relegated Bolton Wanderers at the end of last season, has signed a one-month deal that runs until 26 October. Clark said: "I'd like to thank the board for allowing me to bring in Paul. "He is an experienced defender who will enhance our playing squad." 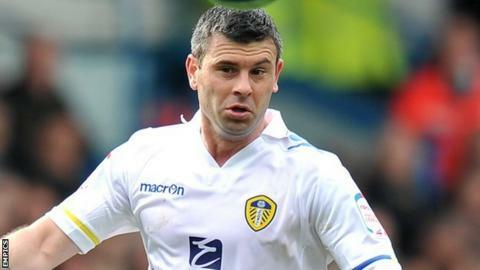 Already without injured skipper Stephen Carr, who has a career-threatening knee injury, Clark last week lost season-long loan signing Paul Caddis, who is expected to be out until Christmas at the earliest once he has had shoulder surgery. And, after losing David Murphy with a torn hamstring midway through the first half of Saturday's 5-0 home defeat by Barnsley, the Blues boss is now also without Pablo Ibanez, who is expected to be out for four weeks after breaking a bone in his foot. "While I have been impressed with the progress of our young defenders, the injuries have left us with just two fit senior defenders," added Clark. "So the acquisition of Paul was one we needed to make. "As a senior professional, Paul will give us that added experience which is always useful in this competitive division." Former England Under-21 international Robinson began his career with home-town club Watford before being signed by Gary Megson for Albion in 2003. After six years at The Hawthorns, a season-long loan move to Bolton was made permanent in 2010. But Robinson, who is expected to make his Blues debut in Saturday evening's clash with leaders Brighton at the Amex Stadium, has not played since finishing last season out on loan with Leeds United.